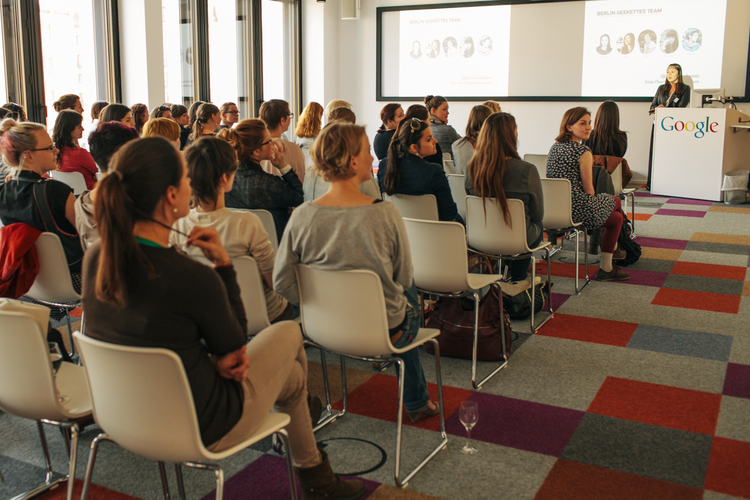 The Berlin Geekettes Mentorship Program kicked off at the end of May, and will run until November 2013. The 5-month long program is focused on bringing together mentors and mentees with mutual career interests and expertise to support their professional and personal development. We're at the halfway point right now, so it's a good chance to look back at the achievements so far and think about the future. For me, this is the perfect opportunity to reflect on what I have learned so far during the two and a half months as a mentee. Finding the right mentor for your personality, your professional background and your current goals is definitely not easy, but the Mentorship Program had a great solution for that challenging task. The matching process was based on the mutual career field and the concrete goals the mentor and the mentee would be able to work towards together. One of the most important questions in the application form for the program was: "what is the goal I want to reach and in which area would I like to get support?". Then the Berlin Geekettes team made the perfect match seem so easy and found the right mentor for me—I am finishing my master studies in communication science right now and my mentor Nicole is an experienced consultant and mentor. I am just starting to work on my own social enterprise, and Nicole has long-year experience in developing tactics for starting businesses. I am passionate about social innovation through technology and she has a talent for seeing potentials—plus she has deep knowledge of tech. And this was just the start of our mentor-mentee relationship. Since this was the first time I had become part of a mentorship program, it was interesting for me to figure out what our relationship would look like, what our goals would be and how we would work together. I found our relationship bringing interesting role expectations for both of us. Nicole is my coach and advisor—giving guidance, support and feedback. She is also a nurturer of possibilities—she's been constantly identifying resources to support my professional development, seeking opportunities for career growth and expanding my network. On the other hand, as a motivator, she is being completely honest while recognizing my weaknesses and offering constructive feedback. On the other side, I as a mentee, also had to learn what my part of the relationship was. I wasn't just a student in a classroom, waiting passively for the information and writing it down—I should instead also take an active role, setting objectives, making the most of my mentor's time to meet these, setting time aside for self-reflection and constantly evaluating the progress. Nicole and I found the perfect balance between our roles. She is pushing me further, helping me get outside of my comfort zone and letting amazing things happen. Pushing enough, challenging often, but not pushing too hard—because being too close to the limit could lead to frustration and aversion. I really enjoy how we pursue things together and I trust her and I appreciate her ideas, her suggestions and advice. On the other hand I also try to stay autonomous and not always depend on her, but to answer the simpler questions and solve the problems on my own. I found myself growing more confident and courageous with every single day. I conducted conversations I had been afraid of. I approached important people from my professional field I had wanted to talk to for a long time. Nicole encouraged me to apply for the Geek Girl Meetup in July and I spoke there, having the chance to present some interesting insights from my current work and to meet amazing women from all different fields of work. It also changed my perspective on public speaking a bit: I can now see that it is mostly about being confident about your topic and having experience in dealing with questions. By encouraging me to try this out mostly for the purpose of getting started and doing that for the first few times, I am now much more open and looking for other opportunities to speak and understand how to draw from these experiences for the future. Furthermore, Nicole supported me with a very important application for a scholarship by showing me that I can prepare for the interview even better than I had thought. I applied for a grant by PEP Germany to work on my own project, creating a mobile app that helps people suffering from eating disorders throughout their therapy. I not only won the scholarship, but the judges complimented me that my preparation and presentations had been above what they were used to. I had prepared an informative printout of the presentation, and my slides were perfectly addressing all their questions without them even having to ask them. For this, Nicole and I did a few session (in person and through skype) and because she had been in situations like this many times before, she was able to give me insights I had not thought of before. I was nervous about the one-to-one questioning with each member of the jury, but through simple role playing and putting on different hats Nicole was able to make me better understand how such a jury thinks and works. In the end, it was still my work put into it and my effort in preparation, but the mentoring really helped me, because I was able to work on my specific problem and ask all the questions I needed to ask. At a certain point during the mentorship, I started taking my self-confidence naturally, and I found myself encouraging others—of course in their own field or work. And this is definitely one of the amazing things I've learned and which I will develop further my whole life. The great experience I am making with the mentorship program made me motivate my friends to apply for the upcoming round—so that they can also experience the great power of working on your objectives together with an experienced mentor. But not only this. Just one month after the program had started, I had a coffee meeting with a lovely lady working in the Berlin startup world, with a great attitude, a lot of experience and inspiring ideas. After telling her more about the program, I spontaneously said "You should definitely sign up as a mentor for the next round of the program". She responded with a bow of her head, and said "Oh no, I don't think I'm good enough to do it". Saying this despite her level of competence and expertise! At this point I realized how important it is to encourage other women with so much knowledge and experience to get over their uncertainty and share the valuable knowledge with young women, who could be needing exactly their support in this exact moment. The mentorship program is not just about the one-on-one mentoring, but is topped off with monthly meetups where all mentors and mentees have the chance to meet, exchange ideas and share their stories. In addition, inspiring speakers present a variety of topics of interest to the group - like Negotiating, Finding your Career Direction, or Pitching skills. The presentations as well as the discussions afterwards are enriching with knowledge and different points of view, since everyone in the room has made a different experience and is willing to share their own story, so that also others can learn from it. Furthermore, the chance to meet other outstanding Geekettes with different background, but the same passion for learning and sharing the new knowledge is exceptional, gives me wings and makes me feel proud to be part of this lovely community. During the last two and a half months of the program, I have been asking myself what I could give back to mentor. Her motive is not to receive something in return but isn't every relationship about constant exchange, about giving and receiving? But then I realized what I could give back. Making your mentor realize how valuable she really is to you is one of the most important things you can do. You should let her know that she had a huge part in your success. Acknowledge your mentor to others, recommend her to new contacts and help expand her network. You can also offer your mentor assistance with projects of hers which you might be able to support with your experience or knowledge. This way you will lighten her workload and gain some additional experience. I don't know what's coming next and how our relationship will develop after the official mentorship program is over. But I am enjoying the great energy right now and I'm looking forward to the next 2 months of communication, enriching mentorship and exchange. I'm happy and many thanks to the Berlin Geekettes team! Ekaterina Karabasheva, the menee: will soon receive her Master's degree in Communication in Social and Economic Contexts from the University of Arts in Berlin. She is working on an smartphone app to help people suffering from eating disorders throughout their therapy. During the mentorship program she received a scholarship by for her social involvement and is currently committing herself full time on the project. She is looking for supporters who would like to help out with the design or technical part of the app, so ping her via her on twitter if you'd like to get involved by any means. Nicole Simon, the mentor: has been consulting and mentoring for many years and specializes in tactics and digital craftsmanship. Being German but working mostly in an international environment and mindset, she likes to build bridges between those worlds, like f.e. supplying information about events and jobs in Berlin tech and startups. You can find her on twitter, Facebook and she mostly 'blogs' on Google Plus.